Back in January, I learned I'd need to go out to Arizona for the full-time job and my wheels immediately started spinning. "Southwest road trip in March???" I texted Jake with a cactus emoji. He didn't hesitate, putting together three possible itineraries nearly overnight that would take us through the desert, down canyons, over mountains, and more. Well, over the last week we put 1200 miles and a thick coat of orange dust on a rented Toyota doing just that. Starting in Scottsdale, we traveled North up Arizona to Sedona, Flagstaff, the Grand Canyon, and Monument Valley, then over into Utah to see Bryce Canyon and Zion National Park. After Jake met me in Scottsdale, southwest sushi take-out in hand, we hit the saguaro-lined road headed North in search of red rocks. They showed up in the distance after about two hours, amidst cooler temperatures and passing rain showers. It’s a dramatic entrance into Sedona, buttes rising all around, their glowing red sediment beckoning you into Northern Arizona. We stayed at The Orchards Inn, which was my favorite stay of the trip – it may have been too nice, we were totally spoiled on the first night. A cozy corner fireplace, king bed with seven (!) fluffy pillows, and a back deck with just about the best view in town made us want to stay the rest of the week. The hiking in Sedona is so very pleasant. Jake’s itinerary included PLENTY of hiking to no one’s surprise, and Sedona’s perfectly maintained, scenic trails were just the way to warm my wimpy winter legs up. We explored the Baldwin Loop the first day, an easy two mile trek around Cathedral Rock that leads to a perfect little swimming hole, and then the Mystic Trail, Hogwash Trail and Broken Arrow Trail on day two, which totaled to six miles over and around the red rocks. The views are incredible, so there were plenty of stops to take it all in and snap photos (I brought my twin lens reflex). Even at the end when we emerged at the Chapel of the Holy Cross, I felt like I could have gone further. But we didn’t, and instead I got a double order of avocado toast and scrambled eggs at Pump House Station, to Jake’s amusement when they brought two separate place settings all for me. I cleaned it up. Sedona is one of the most beautiful places I have ever seen, and the mystic vibes, vortex-seekers, UFO tours, and kitschy crystal shops only add to it. I could hardly believe it was only the beginning of our trip, and it was tough to leave such a desert haven. We climbed the mountains along the Oak Creek Canyon, spiraling up towards Flagstaff. Towering evergreens begin to line the landscape, snow-capped Mount Humphrey looms into view, and you begin to wonder if you’re in the same state. Arizona is incredibly diverse, a range of elevations bringing on wildly different climates that make for a packing challenge (so many layers). We were shivering when we got out of the car at The Weatherford Hotel. This historic hotel had that old New England creepiness that I feel at home in; no doubt that place was riddled with ghosts. Our room was charming. The bathroom was a Wes Anderson moment, offering an emerald claw foot tub complete with a hand-held shower head. Not our first choice after a long day of hiking, but it was awfully cute and did the job. The real destination in Flagstaff was Pizzicletta, an infamous local pizza joint. I’d been once before last summer, on another work trip, and had talked it up to Jake ever since. The tiny establishment serves up beautiful wood-fired pies, and we enjoyed arugula-laden slices at a long family-style table, dough flying around behind us. We talked late into the night and watched locals filter in and out. After an early breakfast at Tourist Home Café, where we loaded up on eggs, root veggies, and more avocado toast anticipating the hike ahead (and the lack of decent restaurants to come), we hit the road toward the Grand Canyon. The South Rim is only about an hour and a half away. We started at the East end, at the Desert Watch Tower. You’ve never seen something so big in your life as the first time you lay eyes on the Grand Canyon in all its glory. Tourist-ridden though it may be, that big hole in the earth is worth seeing again and again and again. We made stops along the rim, and ventured down into the canyon at the South Kaibab Trail. It’s a very popular hiking spot, and for that reason, a bit intimidating; heading down the initial switchback you witness some people in way over their heads coming back up the steep trail, red in the face, huffing and puffing. The further down we wandered, the better the view got, but the more nervous I became about climbing back up as glassy eyed tourists trudged on by. We ventured just a mile in to Ooh Aah Point, which certainly lives up to its name. To my delight a caravan of beautiful mules clopped by, surefooted along the steep trail. My fellow bipedal tourists were not so thrilled; farm girl though I am, I have to say the inevitable manure is POTENT and in high concentration, adding quite a bit of funk to the hike. One guy couldn’t handle it, gagging his way down the trail. We chuckled. The hike back up was not as bad as it looked, and I felt good emerging to the endless view once again. Although, I personally can’t imagine hiking down to the Colorado river and back up. Maybe someday, but not today! We hit the Visitor Center gift shop on the way out, investing in an irresistible Grand Canyon edition Pendleton blanket. This in turn made us members of the Grand Canyon Association, for which we also received a stuffed bighorn sheep we named Rammy. Rammy on the dashboard, it was back in the car, another two hours to go until Monument Valley. We covered a lot of ground that day. A key decision we made was to stop at the Whole Foods in Flagstaff, and stock up on snacks and peanut butter sandwich supplies. Food gets pretty scarce at this point in the journey, and there really isn't even much at Grand Canyon - it's all sort of bland looking and overpriced. Monument Valley, in all its awe and beauty, is not exactly a place to go eat. Bring your own supplies. It was a race against sunset; we sped down the endless, lonely highway to catch those glowing buttes as the sun creeped nearer the horizon line. We arrived at The View Hotel just in time, photographers making a nightly pilgrimage to capture the three iconic mittens entering twilight. We burned rubber, Jake practically exiting the moving vehicle in a tuck-and-roll, clutching his DSLR. So worth it though. This was possibly the most beautiful, picture perfect sunset I have ever seen. The hotel itself was great, living up to it's name 100%. Waking up to those three mittens peeking outside the sliding glass door was just surreal. Riding in Monument Valley was the highlight of the trip for me. 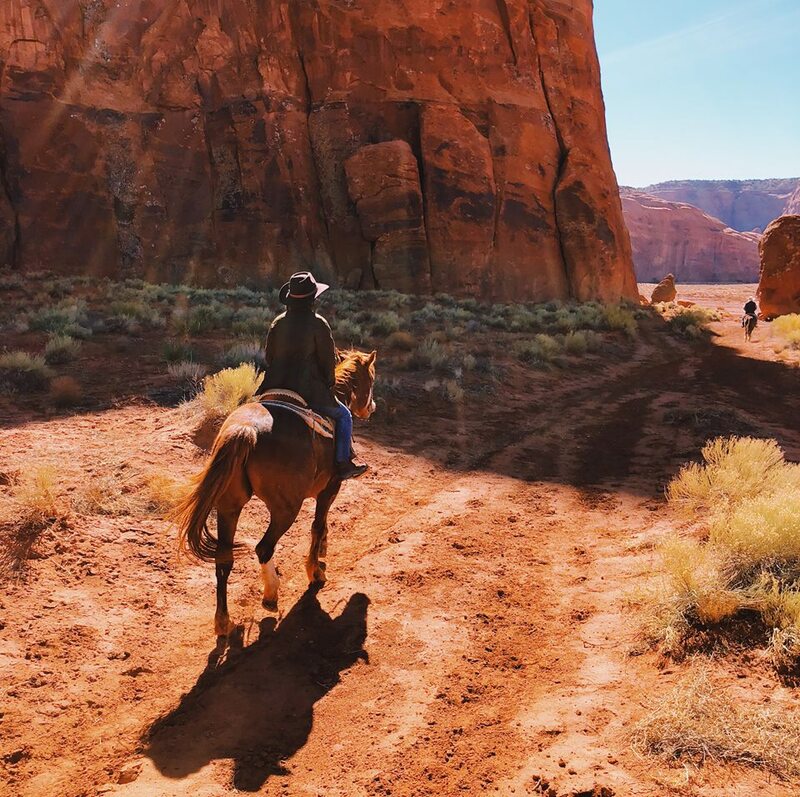 We took a rental-smashing drive down the treacherous Valley Drive Road to find Dineh Trail Rides, where we met up with our Navajo guide Jerome and the three mustangs that would carry us through the reservation. Seeing the valley through the ears of my mount, Geronimo, was one of the best experiences of my life. We trotted across the desert, Jerome pointing out the passing buttes named for their curious shapes, and the settlements of Navajo families, illustrating the history of his people's connection with the land they were placed on. "They sent us here to die," he explained. "But we are resilient. We survived, we're still here today, and we have embraced the land we live on and our way of life." Patting our horses in gratitude for an unforgettable ride, and thanking Jerome who bid us "hágoónee", we loaded back into the dusty rental, destined for Bryce Canyon. We made a quick stop in Page for excellent Mexican food and a quick view of the Instagram-favorite Horseshoe Bend. We made it to Bryce Canyon just before nightfall, exhausted as we tucked into a sort of weird spaghetti dinner at a cowboy buffet. The next morning we awoke early thrown back into winter; a light snow had fallen and the thinner air was a chilly 30 degrees. Jake scraped ice off the Toyota's windshield and we headed towards the canyon. If you want to get an idea of what it's like to live on Mars, Bryce Canyon National Park is the place to go. And what a treat to have it frosted with a little snow! The orange hoodoos rising from the steep cliffs, dotted with Ponderosa pines offers a gorgeous pallet that I wanted to live inside. We hiked down from Sunrise point and over to the Queen's Garden Trail. There were so many fun nooks and crannies to explore. Lots of little doors are chiseled out of the rocks and natural windows frame picture perfect views. It was dreamlike and romantic - and sort of a difficult hike back up! Wrapped up in all the surreal beauty, you don't realize how far down you've gone. But we made it up just in time. We watched a little blizzard sweep over the canyon, and fade the orange landscape into creamy white. We made it to the car just as the view was completely erased by falling snow. Our final destination was Zion National Park, not too far from Bryce. The drive into the park along Zion Canyon Scenic Drive is sublime, the road curving around towering sandstone cliffs, sending you through a mile long tunnel carved into the center of a mountain and spilling you down an impressive switchback, into the little town of Springdale. You expect a T-Rex to come around the corner at any moment. We had (Jake had) hoped to attempt The Narrows, a gorge hike down the Virgin River. I was feeling very nervous about this one, water levels high as snow melt trickles in this time of year and cold currents making for numb toes. And it's not an easy hike to boot. Jake had faith in me though, and I nervously tried on neoprene socks and a dry suit in preparation for the next day. To Jake's disappointment and my relief, the river flash flooded overnight after a downpour, and the trail was closed to hikers. I promised Jake we'd come back in warmer temperatures and a gentler current. Instead, we decided to take on the Hidden Canyon Trail; if we couldn't see the park from the bottom, might as well climb to the top. The most difficult hike of our trip, the initial switchback going up Hidden Canyon isn't much fun, but things get easier even as they look more scary. You become very exposed as the narrow path cuts into the side of the steep canyon, grab-chains offering a little comfort for your left hand. The views are sweeping though, and you forget to be scared. 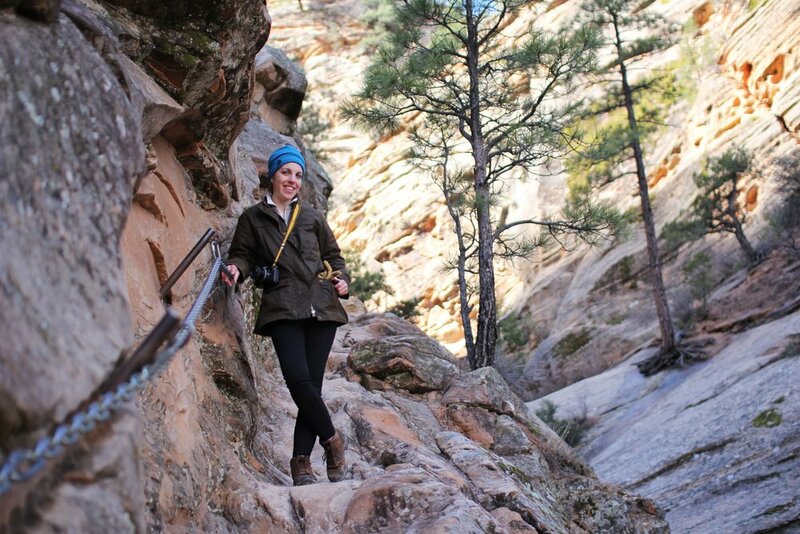 The hanging canyon that the path leads you to is serene and fun to explore, and we sat down to snack on a granola bar. We did two more little hikes after this, The Canyon Overlook Trail and Emerald Pools Trail which both offered easy access to incredible vistas (and waterfalls!). It was a full day and we saw the park from all sorts of interesting angles. At the end of the day, we just hopped on one of the shuttle buses to do a full loop around the park, sleepily taking it all in one last time. We had an indulgent celebration dinner at Zion Pizza & Noodle Co., where we ordered both pizza AND noodles, and enjoyed it on the deck as sunset illuminated the mountains. It was the perfect ending, and we went to bed early in preparation for the journey home. I can't recommend doing this trip yourself enough - it was such a refreshing perspective on our country, offering all sorts of adventure. I'm most happy to be home, New England spring within reach, but I'll always be ready to grab my cowgirl hat and head back out West. The Homegrown Studio provides creative marketing and graphic design to farmers, craftsmen, and agricultural businesses.